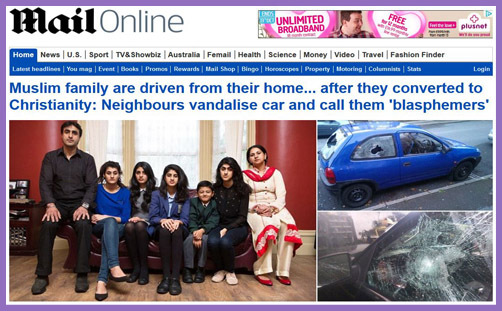 “Muslim family are driven from their home… after they converted to Christianity.” “Neighbours vandalise car and call them ‘blasphemers'”; “windows are constantly smashed”; “family attacked in the street”; “Bradford ex-Muslim family persecuted for their faith”. This is not Afghanistan, Pakistan, Syria or sub-Saharan Africa. It is Bradford, England, and this is the the 21st century. We read that Nissar Hussain, his wife Kubra and their six children all apparently left Islam and converted to Christianity in 1996. The testimony of their conversion is missing: the Daily Mail isn’t particularly interested in how they discovered that the Qur’an is full of lies, that Mohammed was a false prophet and that Jesus is the way, the truth and the life. And if the Mail bothered to find out, they probably wouldn’t dare print it for fear of reprisal. So the journalist’s focus is on the Hussain family as “blasphemers” – apostates from Islam – and then on the apparently self-appointed sharia community in Bradford which is intent on meting out a particularly robust punishment, as demanded by a particularly robust interpretation of an equally robust school of sharia jurisprudence. For some Muslims, “There shall be no compulsion in (acceptance of) the religion” (Surah Al-Baqarah, 2/256). For others, “Any one who, after accepting faith in Allah, utters Unbelief – except under compulsion, his heart remaining firm in Faith – but such as open their breast to Unbelief, on them is Wrath from Allah, and theirs will be a dreadful Penalty” (Surah An-Nahl, 16/106). And so we read of the “dreadful Penalty” being meted out by the jihadi vigilantes of Bradford: harassment, bullying, intimidation, criminal damage and violence. It’s not quite death, but it’s not much a life, either. For some unexplained reason, the police “are reluctant to treat the abuse as a hate crime”. It’s just appalling. Again, we aren’t told why. On the face of it, it is quite patently a hate crime, unless the Mail is intent on stirring the pot of police prejudice which designates ‘Islamophobia’ a ‘hate crime’, but any attacks on Christians cannot stem from hate because, well, this is England in the 21st century. Forget that Jesus said, ‘And ye shall be hated of all men for my name’s sake‘ (Lk 21:17), because only adherents of minority faiths are protected against ‘hate’: and the only significant problem in society is ‘hate’ expressed against Mohammed, the Qur’an and Allah, or to adherents and disciples thereof. There might be the occasional skirmish with other members of the pantheon and their followers, but usually no more than the measure of lawless capers committed in the name of Jesus. But there’s something odd about this story. He also criticised the Anglican Church for failing to provide any meaningful support. ..Although their faith remains strong, Mr and Mrs Hussain no longer attend church. ‘We have given up on the Church of England, they have done nothing for us,’ said Mr Hussain. The younger children from both families attended the local Church of England primary school, where a majority of pupils were Muslims of Pakistani heritage, but car sharing trips were soon stopped by the other family. Mr Hussain said ‘word was spread around the playground’ about them being Christian converts and their youngest daughter was bullied. The assertion appears to be that the local Church of England school tolerated chronic playground harassment or turned a blind eye to bullying. To read that a Church of England school failed in its duty of care to the extent that a young Asian convert to Christianity “was heartbroken and made to feel like a second class citizen” is, frankly, quite literally incredible. Teachers and headteachers bend over backwards to ensure that Every Child Matters: when it comes to children’s well-being, Church of England schools have rigorous anti-bullying policies, in accordance with statutory requirements on child protection and safeguarding. And they implement them. If there were serious concerns, were these raised with the school’s child protection coordinator? Were meetings requested with the child’s teacher? Headteacher? Were complaints escalated to the governing body of the school? Or to the Church of England’s education service? Bradford’s churches and schools are now under new management: the Diocese of West Yorkshire & the Dales. The new Bishop of Bradford is the Rt Rev’d Dr Toby Howarth, and his boss is the Bishop of Leeds, the Rt Rev’d Nick Baines, who had been Bishop of Bradford for the preceding three years. If it be the case (and it may well be) that no ministry team in Bradford has provided “any meaningful support” to the Hussain family, might we have a few more details? If it be true (and it may well be) that the Church of England has “done nothing for us”, could we please know a few specifics and particulars, so that Bishop Toby and Bishop Nick might learn from the Church’s past errors, shortcomings and pastoral deficiencies? Instead of just trashing the entire institution (though it may well deserve it) in the Daily Mail, might someone who knows something please get in touch and explain why a brave family of Bradford ex-Muslims has been so terrorised and persecuted by gangs of devout Bradford Muslims that they had no choice but to depart the Church of England?